You might be an avid tennis player who is trying to find ways to take your game to the next level. You might also be a beginner looking to improve your skills. While you can always hire a trainer, that might prove expensive plus a trainer cannot be with you 24/7. The next best alternative is a tennis ball machine. Tennis ball machines have helped professional tennis players improve their game by a wide margin. In addition, you can practice for as long as you want (Source). At whatever level of skill, tennis ball machines have more pros than cons. 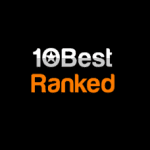 With that in mind, here is a review of the top rated tennis ball machines. 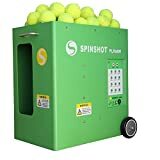 The Spinshot-player gets the number one spot because though it is midrange priced; it remains one of the most advanced battery-operated and portable tennis ball machine. The machine has an innovative design that allows you to program the height, direction, spin, and speed for each sequential shot. You can then save these programmed settings on the machine as your personalized drill. The capability facilitates convenience because it allows you to access a drill quickly whenever you need to practice. It is also easy to program. You can always keep tweaking the personalized drill with time to increase complexity and improve your skills. Note that you can combine vertical oscillation with horizontal oscillation or pretty much any oscillation mode you want to play with for advanced practice routines. Consequently, the unit is ideal for both beginners and tennis pros. The machine has an easy to understand and easy to use user interface. As a result, even the youngest players can operate it. To make things even easier for you; the machine allows you to program drill settings using your phone and then save them on to the machine remotely. When you next access the machine, all you have to do is press the drill-x button, and you will be ready to start the game. The machine’s dimensions are 50cm in height, 45cm in length, 30cm in width and 19 kilograms in weight. That makes the Spinshot-Player one of the most compact and lightweight machines. It is especially so when you compare it with other tennis ball machines that have the same features. The unit comes with a 12V and 12Amp battery that you have to order separately. Also included, is an eSmart battery charger. Allows a wide array of oscillations—vertical, horizontal and so on. The unit supports remote programming of drills via the phone. That facilitates convenience. The remote control app is free hence no additional charges. It is one of the few tennis ball machines not made from plastic. Consequently, it is sturdy. Compared to most machines, it is affordable. Extra cost incurred when purchasing the main power module. Lobster Sports is a brand that has been manufacturing ball machines since 1971. They are a reputable brand and are known for their quality products. The Lobster Sports Elite Grand Five is one of their high-end machines. The machine has 8-inch all-terrain wheels that make the unit portable because you can easily pull and push over any surface. Thanks to the folding handle and inverting hopper you can effortlessly transport the Lobster Grand Elite to and from the court because it can fit in both the trunk and the car seat. It essential to also realize that when folded up; the machine only measures 29” by 21” by 15.5”. Consequently, it is easy to store as it can fit in the garage, spare room or even the closet. Regarding functionality, the unit comes preloaded with drills that tennis pros have helped develop. The drills enhance your court positioning and strategy against all kinds of players. The unit also offers an expanded oscillation function complete with three positional settings—narrow, medium and wide. The oscillations sharpen both your forehand and backhand groundstrokes and also your footwork. Note that other than the pre-loaded drills, the Grand Elite also allows you to customize your drills. You can choose the ball speed, the ball spin, the feed rate of each shot and so on. Once you do so, you can then save the settings as your personalized drill which you can always access by the click of a button. Included in the package, is a fast charger that reduces the charging time by 3-6 hours. Although the unit does not come with the remote, you can use your iPhone, iPad or iPod as a remote control with the grand remote for Apple. With the remote installed, you can instantaneously change your ball machine from across the court. Alternatively, assuming you lack an Apple device, you can purchase the remote separately. The unit is incredibly portable. The unit is of high quality. The unit allows a wide array of oscillations thanks to the three settings. The pre-loaded drills are as good as any pro drill. The unit is made from plastic material which is less durable. The Match Matte Rookie is an inexpensive tennis ball machine that provides all the functionality needed to improve your game. It is especially beneficial to beginners. The unit has a 10-second ball feed delay option on startup that allows one to get into position. The delay also ensures there are no wasted balls. It has a triple threat elevation and a ball speed that ranges from 10mph all the way to 27mph. The speed range helps in gradual skill development and the development of a better defense in your game. The Rookie is a light machine, weighing only 22 pounds. However, the lightness is not representative of its quality. It has an aluminum outer shell and a urethane pitching wheel. All internal components are high-grade aluminum or steel. That makes the machine durable. The unit has user-friendly controls that are easy to figure out. The user-friendliness combined with the soft toss at low speeds option makes the machine suitable for children as well. The rookie is manufactured and assembled in the United States. It, therefore, meets all the US safety standards. 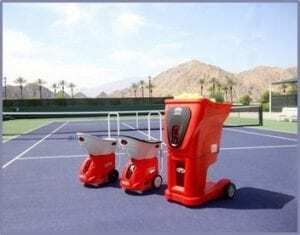 The unit is easy to set-up because all you need to do is position the Rookie on the tennis court, turn it on and then set up the ball speed and feed. As a result, you not only save time, the unit is also convenient. Finally, the unit has a heavy duty battery complete with 5-hour battery life. Consequently, you will wear out long before the battery does. The aluminum casing and the internal construction ensure the unit is long lasting. The unit has a 10-second startup delay. The unit is perfect for beginners and children. The unit is too slow for advanced players. 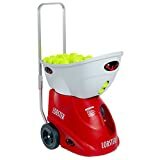 Most tennis ball machines especially the good ones that can cater to both professionals and intermediate players usually cost more than $1000. However, with the Lobster Sports Elite, you get all the advanced features but at an affordable price. To start with; similar to the previously discussed Lobster Elite Grand, this particular machine is also easy to move and easy to transport. 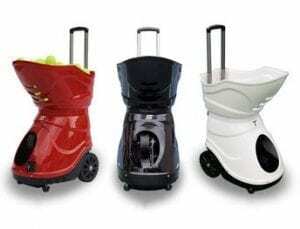 It has the 8-inch all-terrain wheels, the folding handle and the inverting hopper that facilitates the easy transport. It is also easy to store thanks to its 29” by 21” by 15.5” dimensions when all folded up. Regarding functionality, the unit has a spin control feature that you can adjust for both topspin and backspin. Note that you can make these adjustments at different levels. The functionality helps a player practice and perfect different aspects of the game. The machine also offers manual oscillation and a ball speed of between 20mph and 70mph. The speeds are good enough for both advanced players and beginners. The unit has an elevation of between 0 to 50 degrees to facilitate versatility. Though the battery is small and lightweight, at full charge, it can last up to four hours. At only 35 pounds, the unit itself is lightweight enough for easy movement from one spot to the other when in the court. The unit comes with a fast charger that reduces the charging time by 3-6 hours. Similar to most Lobster products, there are accessories you can purchase separately if you so wish. The accessories include an external battery pack that extends playing time by four to eight hours. You can also purchase an external AC power source that converts your machine into an AC machine for unlimited runtime. The unit has a capacity of 150 balls. The unit has a maximum top speed of 70mph. The unit has an ergonomic design that is easy to handle. The unit provides for the addition of helpful accessories. The random oscillation helps in improving your control over ball speed. The unit has a manual elevation. Depending on the intensity of use, the battery can last just 2 hours. The versatility of this unit arises from the fact that it has three power options. The three power configurations available are electric (AC), battery or both. That is convenient because you can select what you are most comfortable with. The unit has a maximum spin option. While the unit does not offer control over the spin option; it is still random enough to offer complex drills that ensure you improve your skills. The unit weighs only 29 pounds or 25 pounds for its electric option. That makes it lightweight enough to facilitate easy movement and easy transport. The Isam has a speed range of between 15mph and 70mph. The low-speed option is great for beginners while the high-speed option can cater to semi-pros and intermediate players. The unit has an incredible ball capacity of 250 tennis balls. That is on par with most high-end units. The feed rate is 2-7 balls per second. This kind of feed rate is good for improving your footwork. Finally, one cannot fail to note that Isam offers players a myriad of options from groundstroke to high lobs. The options give complex enough drills for the betterment of one’s game. The unit is easy to set up. The unit will help improve performance and skills by a considerable margin. While perfect for semi-pros, advanced players need more of a challenge than the unit offers. The prices of tennis ball machines vary greatly. From those that cost under $1000 to those that cost over $3000. The price should factor into your buying decision because the higher the cost, the better the quality of the machine and vice versa. While you can still find a high-quality machine at an affordable price, it might take some time. So, consider price carefully and go for a unit that tallies with your budget but still provides value for your money. The universal truth is that anytime you are using a tennis ball machine, you have to move it repeatedly either on or off the court. With this in mind, it essential that you purchase a portable unit. Always look for a machine with built-in wheels and a sturdy handle. If you are a tennis enthusiast, then you know no opponent hits the same every time. Therefore, your tennis ball machine shouldn’t do so either. You need a machine that has as many random shot selections as possible. That way, you will improve your overall game. One of the hardest tennis shot to return is one that is spinning as it comes to you. Practicing over and over again is the only way to get good at these tricky shots. Consequently, your tennis ball machine should be able to serve you balls with a spin on them so you can master them. 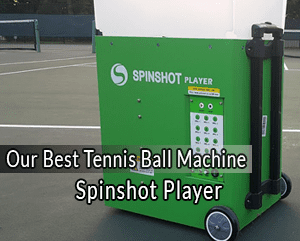 The guide has enumerated the best tennis ball machines in the market today for players with varying skill levels. All you need to do is take the considerations into account, and you will be ready to pick out the machine that tallies with your skill level.